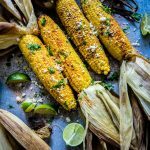 Mexican corn on the cob is coated with juicy butter, finished with chili powder and fresh cilantro, sprinkled with cotija cheese. Yum! Preheat oven to 365º F. You can also put the corn cobs on the grill. Transfer the corn to a plate, peel the husks and silk off, then brush it with melted butter, sprinkle with chili powder and cotija cheese. Serve with fresh chopped cilantro and enjoy!